Pinakin Patel leads the way during the training event in Tauranga. 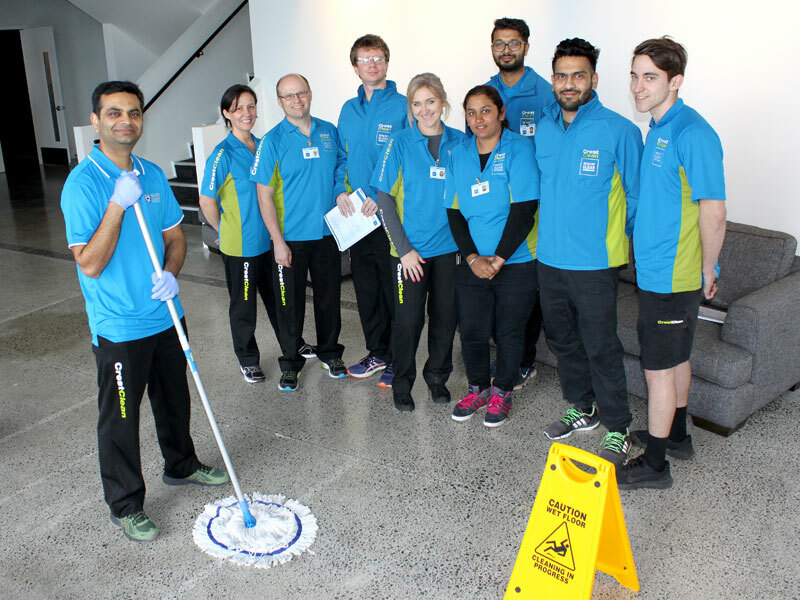 CrestClean’s new business owners rose to the challenge when their floor cleaning skills were put to the test. They were attending an intensive training programme that leads to the Certificate in Commercial Cleaning. Floor care is one of the core units on the Module 1 course. 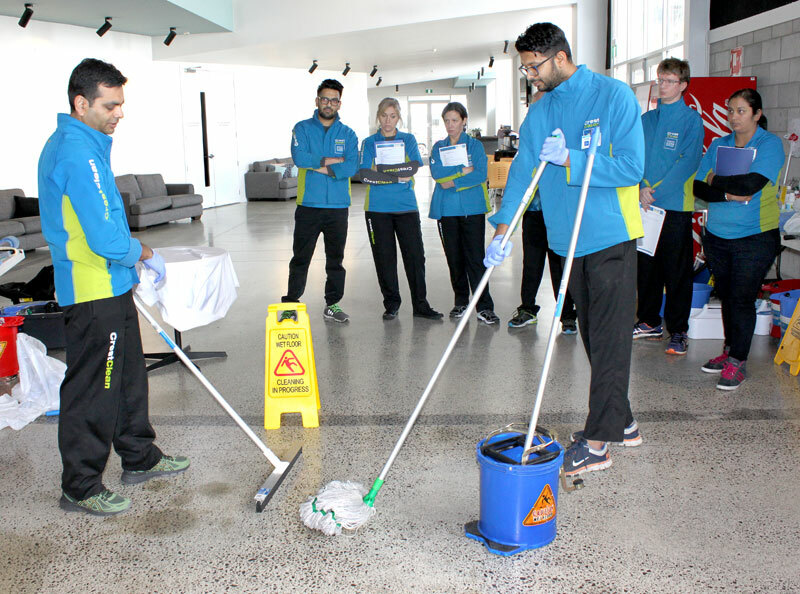 The two day training event in Tauranga was led by Pinakin Patel, one of the company’s most experienced operators who is an expert of all aspects of floor care. Pinakin, who has been a CrestClean business owner for 15 years, has recently been appointed as a Regional Trainer for the Master Cleaners Training Institute. After classroom theory, it was time for the trainees to put into practice what they had learned. Overseeing the two-day training programme was Adam Hodge, Master Cleaners Training Institute’s CEO. While floor cleaning might appear a straightforward task it was imperative the correct method was followed, says Adam. After a floor is mopped a second step involves skimming the area with a rubber bladed broom to remove excess dirty water. A third step, to dry the surface, was crucial, he says. “If you mop a floor and just leave it to dry naturally then about 70 percent of the dirt will remain because it will dry in with the dirty water that remains,” explained Adam. Adam says a simple way to prevent floors becoming grimy was to install mats in areas of heavy foot traffic. “One of the easiest ways that customers can maintain their floors is by putting down proper sized mats at entry doors to the building. The training course was held at Elim Church, Tauranga. The venue provided franchisees with real-life situations they are likely to encounter in their work. The Module 1 course covers a multitude of skills that CrestClean’s business owners have to master and demonstrate competency in as part of their ongoing training and upskilling. The course includes sections on health and safety, chemical preparation, safe use and safe storage of equipment. Practical task training included mopping, vacuuming, window and wall washing, damp wiping and polishing. At the end of each training day attendees are quizzed over their competency. “We test how much new knowledge they have taken in and if we need to go over any areas again,” says Adam. The Module 1 course is a “stepping stone” to full certification and the award of a Certificate in Commercial Cleaning. 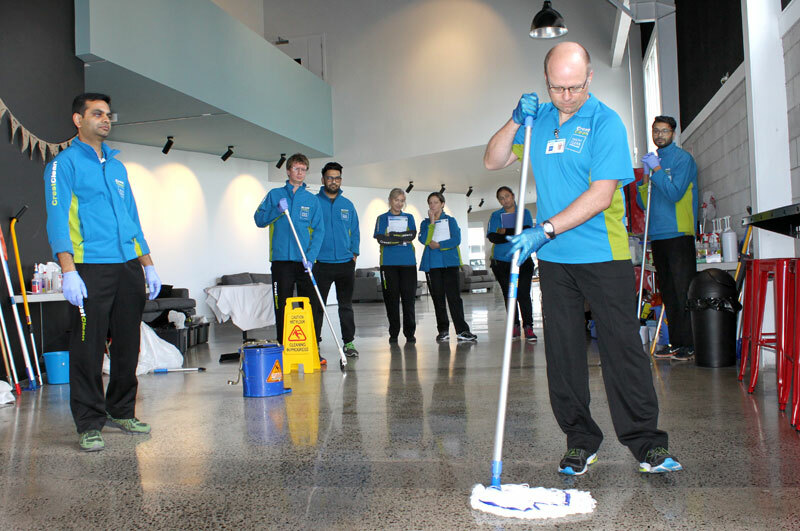 CrestClean is the largest trainer of cleaning personnel in New Zealand. Having fully qualified personnel on their sites gives customers peace of mind, says Adam. 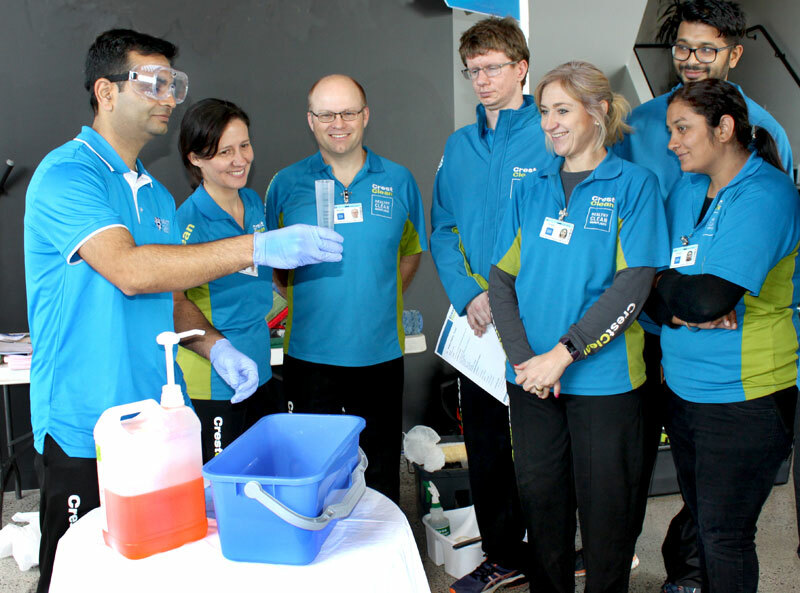 The correct way to dilute and prepare cleaning products is demonstrated by trainer Pinakin Patel at the Tauranga event. Pinakin Patel keeps a watchful eye as franchisees get to grips with mopping during the training day. Blading and mopping under way during one of the training sessions.